Thailand; Bangkok from on high. Feeling refreshed and wide awake, I opened my eyes to a beautiful bright city. The sky looked painted in different baby blues and smoky greys. 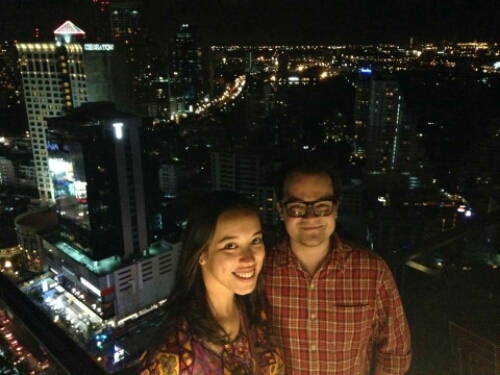 I realised with a start that I could’ve slept through my first day in Bangkok! It felt like nearly midday, but alas, I woke at 6:15am Thai time. Terrible cavity-inducing chocolate cereal and a banana to counteract the synthetic sugars for breakfast. The Barista made me a proper cup of coffee as well, which was most welcome. There was a heavy heat in the air and it was only 8:30am- classic monsoon season on the equator. Technically, we’re on a laneway but it’s more like a road (see, it’s only got two lanes, not sixteen-hundred lanes). The Barista’s apartment has a balcony that overlooks some residential areas and is overshadowed by some high-rises. The balcony has hibiscus, aloe Vera and a few palms and succulents. Banjo and I went exploring. 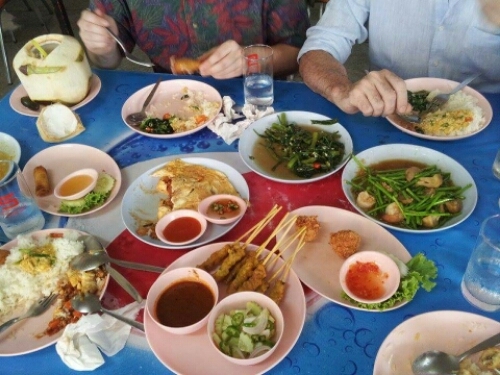 We walked down from Asok station, then in and around some backstreets, and down to Nana. Nothing opens before 10am, it was like a ghost-town. Saw monks praying over people in restaurants, cheap hotels or rooms for rent. McDonald’s serves a Mc D for breakfast, which is chicken porridge (that I have yet to try). It was beginning to get really muggy, but the full heat hadn’t set in yet. I really like how built up the city is. 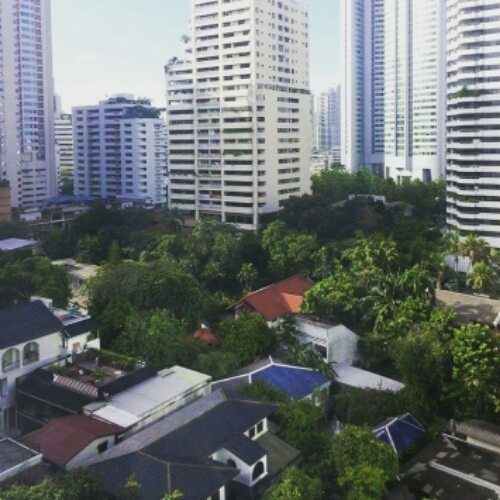 I’m not necessarily a huge fan of development, but Bangkok has an incredible population and to have everyone move around in ground level would be impractical. 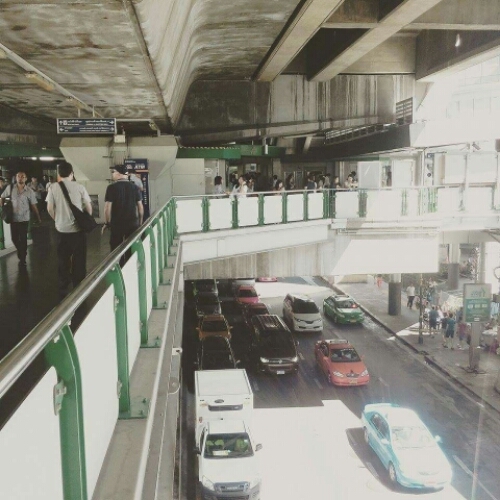 The traffic level is loud and smelly, just as one would expect it to be, but walk up some stairs and you have full access to some retail, thoroughfare between buildings and entrance to the train stations. It’s really efficient and effective- there’s a lot less congestion than I thought there would be. Level 1- cars and traffic. Ground level. Level 2- pedestrian thoroughfare, access to train stations and between buildings. Level 3- top level, sky trains. I exchanged some USDollars at Asok station; excellent exchange rates. I definitely recommend exchanging a tiny bit of cash into That Baht in your home country, but chances are the exchange rates are so much better in Thailand. Incidentally, the man in front of me was sweating so much, his shirt was nearly transparent. Banjo and I went to Terminal 21, which I thought would be just another generic shopping mall. In actual fact, this place is awesome! Fully themed like an airport terminal, there are soaring escalators with ‘flight attendants’ and ‘pilots’ as staff. Each floor is a different city- there’s Tokyo, Istanbul, Hollywood, and Paris and more. There are some big brands, but a lot of the ships are boutique, locally sourced and handmade. Terminal 21- we discovered that 'Terminal' refers to the travel theme and '21' refers to the fact that it's situated on Soi 21. It took us too long to realise the latter. 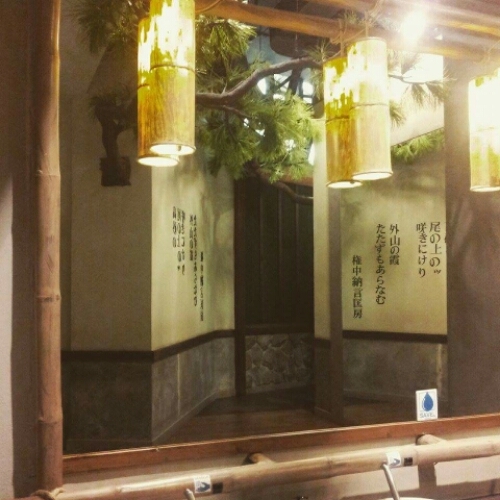 Themed bathrooms really amuse me. At Terminal 21, we met The Barista and one of his mates, who brought his son along, (who is two and roared like a dinosaur wherever he felt shy). We had lunch in a lane just off Sukhumvit, in a place that Banjo had been crooning about since Sydney. It was a large restaurant with bright blue table cloths and a ginger kitten legging between the chairs. We arrived before the lunch rush and ate crab curry; which didn’t disappoint Banjo’s hype. It was creamy, flavoursome and fall-apart in your mouth , morning glory salad; a deep and salty kangkung dish with a punch of chilli, crab balls; crunchy, light and fluffy, spring rolls; meaty and served with a honey dipping sauce, pork mince omelette; sweet and with full-bodied tomato, smooth and nutty pork sate, and asparagus, prawn, mushroom and garlic stir-fry. After the meal, we caught the sky train to Siam. The trains are cheap and very easy to navigate. In fact, I was very surprised at just how easy Bangkok is to navigate. There are taxi motorbikes, if only one person needs to get somewhere quick (although, I have no plans to make use of one), tuk-tuks are plentiful and taxis are very cheap, if you have the patience for the traffic. The train system is excellent. It’s also really easy to navigate as a non-Thai speaker. There are English signs and translations everywhere and most Thai people (in Bangkok) can speak either conversational English or know enough words to help you when you need to know directions. I’ve learnt some Thai and its mostly out of respect. The city would still be accessible for those who can’t read the script. Siam Paragon is deluxe. All the shiny brands, the sparkly cars, the glittering lights. 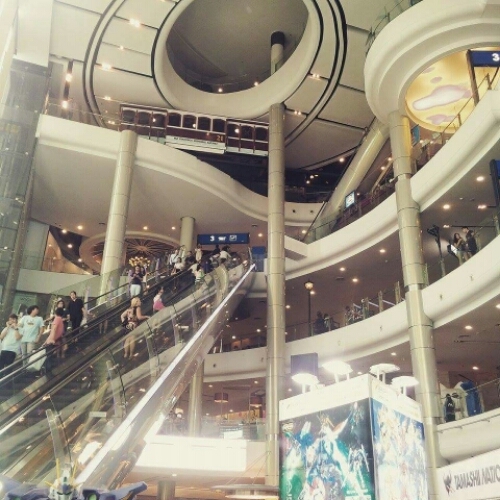 It’s a high-end shopping mall, complete with waterfalls and “Ocean World” aquarium, a bit reminiscent of a casino. We came home after wandering through the air conditioning. Banjo and I had a swim, which was so welcome and refreshing. After, I retired to our balcony. I like being up high- you can hear the pulse, the buzz of motors, beep of traffic, clang of construction, but your not in the thick of it. The lights day and the city glows and the swallows dance and the cats leap between buildings. I sat in The Barista’s balcony sanctuary with a cup of French Earl Grey. The Barista, Banjo and I dressed ourselves up and met one of The Barista’s friends for a birthday dinner. Peppina’s is this little, loud Italian restaurant just off Sukhumvit and it’s sublime. I thought that reading international cuisine in a country with such distinctive flavours would be a stranger, confusing experience. No, this food was excellent. The vintage setting and rustic low beams supported a tin roof and was dimly lit by clusters of lights with the fiery filaments. It bustled with life and character and the food was delicious. For mains, Banjo and I shared a Sicilian pizza; tomato sauce, mozzarella, eggplant, salami, prosciutto, ricotta and basil. The restaurant itself was a wonderful venue too, serving The Barista a bowl of pasta because the waitstaff felt bad that he didn’t order anything. It was a trip to Italy that I didn’t expect to find in Bangkok. 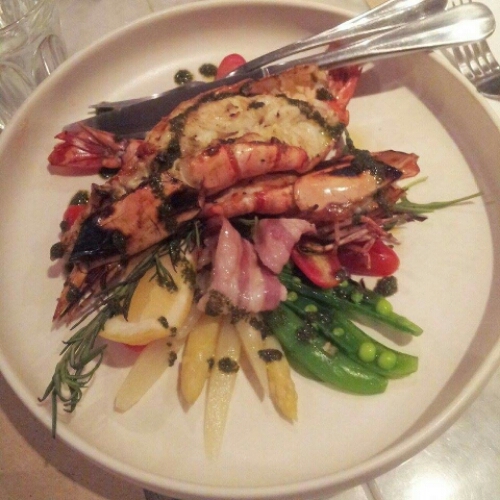 Entree: Grilled Tiger Prawns with sumac, served with crispy bacon on a bed of white asparagus. Our company was nine strong- four couples and The Barista. It was decided that we move to somewhere quieter. We all bundled into some taxis and made our way to The Sofitel, where two of our group were staying. We reconvened on floor 32, the Rooftop Terrace of The Sofitel. What a stunning panorama! Such a beautiful city twinkled down below. It was totally breathtaking and the warm air wasn’t as heavy as down below. What a swell night. Up at 4:30am to catch the early train to Central, then a connecting service to the Sydney International Airport. In a train carriage where everyone is asleep and the sun hasn’t graced us yet, two tradies sat, writing effectively rap poetry and practicing to and fro. The juxtaposition! Here’s a snapshot of waiting at Gate 58 for Thai Airways to board– resentful short shorts kicking her sparkly converse and twisting her pandora rings, chesty cough woman untangling a ball of wool, pregnant customer service, DVT stockings and tingly toes, skinny jeans and haivanas, unpacking a carry-on bag where the wheels on the bag itself are larger than anything that could be packed into that tiny bag, six unattended payphones and a terminal of smartphones connected to the WiFi, tartan flannies, “Mum’s in the bathroom,” flight to Christchurch delayed, “Ma’am, just take a seat!” rash-cheeked babies, pulp murder books, faux Gucci hand luggage, heavy jade jewelry, “Paging final passengers”, last minute adapter purchases, mobs of customs officers and border protection in peaked caps, “Off-loading procedures of yourself and your luggage have commenced”. 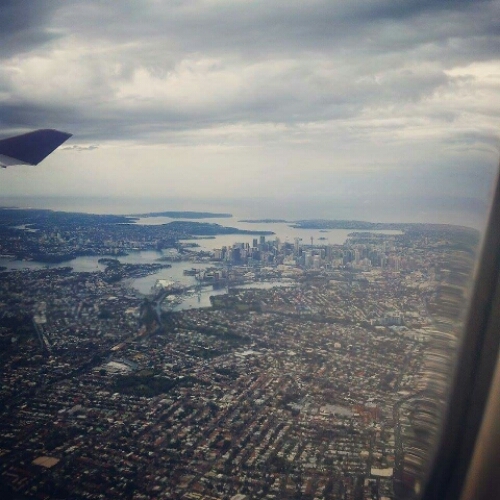 From just above the city of Sydney, you can see the clouds and the sky reflects on any body of water that snakes in and around the Harbour. The sun gets caught and dances between and across buildings. There’s a soft cloud cover just above the sleeping city, but we climb high into the thick fog above. Wisps of white turn into blinding glare and we push through the atmosphere at 920kmphr. Sydney Harbour Bridge and the CBD are dead centre. The flight to Bangkok is nine hours. I had a window seat. I could watch the plane take off, but from where I sat, it was difficult to get out and walk around without disturbing two other people. Banjo was entranced by his game console and he sat beside a tiny rat-man, who ate only one of the two meals served, but had the shakes and a fair few beers on the flight. We sat over the wing, away from the crying babies, just beside the food trolleys. I felt sick, my stomach hollow, but that could’ve been a mix of exhaustion, dehydration, nerves and general fatigue. Lunch on the plane was yellow curry, bamboo and chicken, served with green beans and rice. There was a side of potato and turkey salad, a hot bread roll and a citrus cake. The window was hot in the midday sun. I dared not open it for the blinding glare. Thai Airways was great and the flight was ‘smooth as silk’, just as their motto states. The flight attendants are really hospitable and warm. The second meal served to me was from business class, (which made Banjo hilariously jealous, even though the only difference between our meals was that mine was served on crockery with linen napkins, and my fruit was splayed more attractively). Hokkien noodles with chicken, yum! 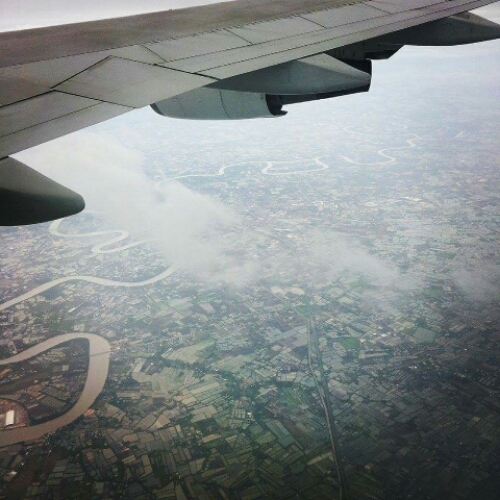 As we drifted through the candy-floss cloud cover, Bangkok revealed itself. Rice paddies blanketed the earth and reflected the sun in a tawny green-brown mosaic and a river snaked between. The patchwork was almost in a perfect grid of varying tawny grades, like a winning quilt from the Sydney Royal Easter Show, with threads of silver. We landed at 4:45pm, Bangkok time and were greeted by temperatures of thirty-one degrees celcius. Baggage claim was a tiny bit delayed, but we managed to get through customs and the Thai border security without a hitch. Banjo’s father [The Barista] was waiting for us on the other side. Together, we limousined back to his place. The view on the ride there was not at all what I expected. It’s a lot more westernised than I thought it would be. There is a strange disparity between construction sites for high-rises and abandoned, semi-developed construction sites. It’s very modern, but there are cracking facades and flaking fabrications. Traffic home was pretty good, until we hit the CBD, then it was thick and tedious. The Barista’s apartment is deceptively spacious. 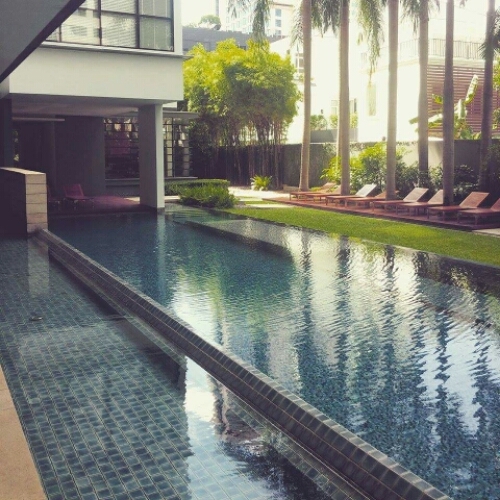 It’s long and overlooks the glowing Bangkok skyline. The views from my room are full-length magic from ten stories up. I’m extremely grateful to be here and cared for in a new city, a different country. The Barista helped us sort out our train passes and Thai SIM cards, which are both very cheap and extremely easy to use. We headed just down the road for dinner at Took Lae Dee, and even thought it was only 9:30pm, my body was telling me it was 1:30am and so I faded fast. Jet lag was catching up to me and I was feeling horrendous, so we ran across the road in the rain to a 24hr Foodland supermarket come diner, to fill our tummies for crashing. After a glorious deep purple lightning show, the heavens bucketed down through the humidity and I [gracefully] slipped in the rain and scraped my forearm. Antiseptic was then number one priority on the shopping list. Attached to the supermarket was a bustling diner-esque restaurant, where I ate chicken pad Thai. Cheap, clean, quick and full of flavour. I was very glad I ate something. 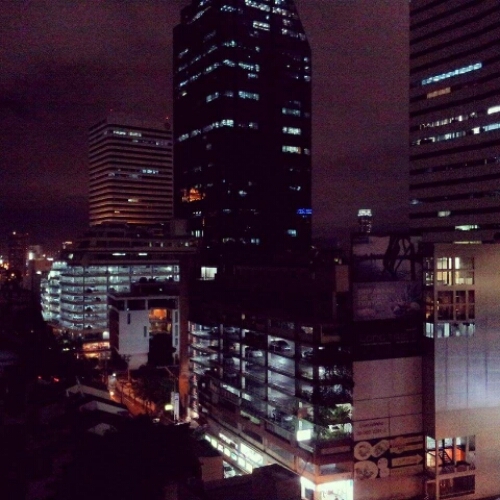 I went to sleep at 2am Sydney time, with the lights of Bangkok twinkling. I left the curtains open. Published in: The Hills Shire Times, The Hornsby Advocate and the Daily Telegraph Online.